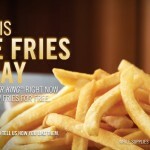 Free Fries at Burger King Today 12/16 | A Savings WOW! Stop by any participating Burger King location today and get a free value size of their new fries. Find your nearest Burger King location!